Chicago — May 2, 2016 — Brainlab, a global leader in medical technology, marks “Brain Tumor Awareness Month” in May, actively participating in patient-oriented events while driving R&D and technology advancements. Brainlab technology is in use in over 4,375 hospitals worldwide and the company is dedicated to improving access to and consistency of treatments for brain tumor patients. 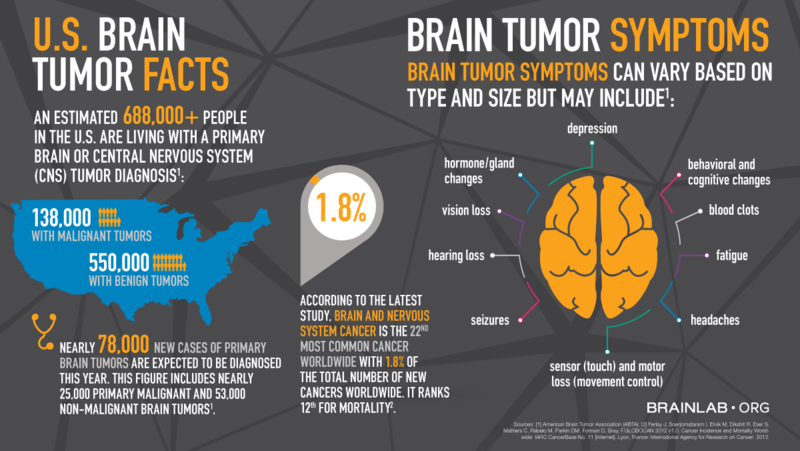 Today, more than 700,000 people in the United States are living with a brain tumor with nearly 78,000 new cases of primary brain tumor diagnoses expected this year alone. Metastatic brain cancer occurs when a primary cancer spreads to the brain and is five times more common than primary brain tumors. Worldwide, brain tumors make up 1.8% of all cancer incidents according to the International Agency for Research on Cancer (IARC). Today, surgery and radiosurgery are viewed as effective options to treat brain tumors. Brainlab offers information-driven technology to enable enhanced decision-making. Surgical navigation supports less invasive and more precise tumor resections compared with non-navigated techniques. Stereotactic radiosurgery helps maximize tumor control while limiting toxicity to healthy tissue and typically can be delivered in a 30-minute painless treatment. Software like Adaptive Hybrid Surgery allows clinicians to carefully balance the risks of both surgical and radiosurgical treatments, allowing different combinations of both techniques. “Ultimately, at Brainlab, we are constantly working to get patients to adjust to the idea of living with their cancer, while still enjoying the things that matter to them, which is different for each patient. The treatment should never be worse than the cancer,” concludes Vilsmeier. Brainlab employees will participate in #WearGrayDay on May 12th. Brainlab employees also took part in the American Brain Tumor Association’s signature fundraising event, the BT5K Breakthrough for Brain Tumors Run & Walk, helping drive awareness and raise over $700,000. The BT5K is held in cities coast to coast throughout the year to help the American Brain Tumor Association fund desperately needed brain tumor research, patient programs and support services. Together we, treat, fight, win. Navigate brain cancer treatment at Brainlab.org. Privately held since its formation in 1989, Brainlab has over 9,000 systems installed in about 100 countries. Brainlab employs 1,300 people in 19 offices worldwide, including 385 research & development engineers, who form a crucial part of the product development team.